Here are some details on what you can do with the School Lunch Ideas page. All lunches are shown by default, however, you can narrow down your choices by selecting categories and/or entering text in the search bar and then pressing “Enter” or clicking the “SEARCH” button. For example, let’s say you have some apples on hand that you need to use. Enter “apples” in the search bar and click “SEARCH.” Any lunches that have the text “apples” in the description will appear. 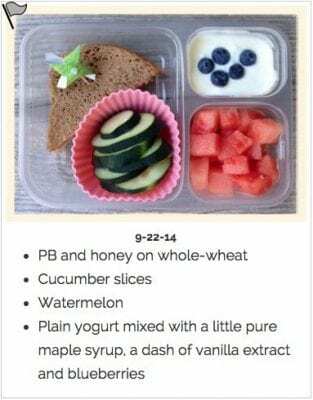 Let’s say your child has a nut allergy so you only want to see lunch ideas that are peanut/tree nut free. Check the box next to”Peanut/Tree Nut Free” and click “SEARCH.” The results will not contain any nuts. You may combine search methods by checking multiple categories and/or entering text in the search box. For example, a search for “pizza” with “Vegetarian” and “Peanut/Tree Nut Free” checked will only result in lunches that do not contain meat, do not contain nuts, and do contain the word “pizza” in the description. Keep in mind that the categories apply to the lunch as a whole. Pressing the “Clear Filters/Show All” button at any time will once again show all lunches. Clicking the grey flag on a lunch will flag it as a favorite and change the flag color to orange. Once you have flagged your favorite lunches, you can show only those lunches by pressing the “Show Flagged” button. You may also print the lunches by pressing the “Print Flagged” button, which is a great way to make a school lunch meal plan for the week! To remove a school lunch from your favorites, simply click the flag to change the color from orange back to grey. Pressing the “Show Flagged” or “Print Flagged” buttons again will update the page. Note that pressing the “Clear Filters/Show All” button will not erase what lunches you have selected as favorites. You can see just your favorites again by pressing the “Show Flagged” or “Print Flagged” buttons. What’s up with the non-lunch results? We may mix in some non-lunch results such as information on a related product (like a Thermos) that we recommend or a link to a blog post/page that we think you might also be interested in (such as our School Lunches FAQ). If you experience any problems with the school lunch ideas page, please contact us and select “report a typo or technical problem” in the drop down box on the form.